Everyone who purchases gasoline pays taxes on that purchase. The state and federal government charge a tax and the local jurisdiction may also collect a tax. Additional taxes may be added for various highway construction and mass transit projects that citizens vote to support. People who buy gasoline for vehicles that are not going to be driven on a public highway are entitled to a refund of the some of the state taxes they have paid on the gasoline not used on public roads. Many people do not claim the refund because they do not have records to support the claim, the amount of the claim is too small to justify the work necessary to claim it, they do not hire an accountant to prepare their taxes or they do not know that they are entitled to a claim. The accumulated unclaimed funds are distributed among state and local programs that regulate or support agriculture. This is done because agricultural activities often depend on fuel used for purposes that do not include driving on a public road, so the taxes were originally paid by farmers and ranchers. 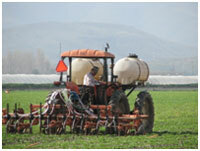 These uses include fueling all kinds of farm equipment including tractors, generators and pumps. The Agricultural Commissioners receive a portion of these funds. The funds are designed to close the gap between the support provided by the state or federal government, and the support that each county is able to contribute to the local Agricultural Department from the County General Fund. In recent years approximately 70 to 75 cents is collected for every dollar contributed from the County General Fund. The amount varies depending on the price of gasoline and the state tax rate. The greater the support from the county the more UGT the county can claim. Most of the programs that provide services to the industry are funded by the industry. 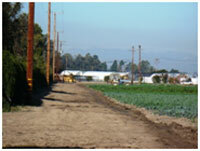 State and Federal funding is often heavily subsidized by the agricultural industry as well. At least a portion of the UGT comes from taxes originally paid by the agricultural industry. In general we can safely say that agriculture pays more than its fair share to support the regulations that pertain to their industry.